(16). In more recent studies, this angiotoxic effect has been attributed to the amount of the DMSO injected and the velocity of the Onyx injection, with larger volumes of DMSO and faster injection rates being related to angiotoxicity (17). Chaloupka et al. (17) showed that slow injections in the swine rete mirabile (between 30 and 90 s of small volumes of DMSO [0.5 or 0.8 mL]) are well tolerated in terms of less angiotoxicity. The neurointerventional team at the University of California at Los Angeles has reported encouraging data on 23 patients who underwent Onyx embolization of AVMs (15). A 63% reduction in AVM volume was observed after a total of 129 arterial feeders were embolized. There was a 4% permanent morbidity. Of these 23 patients, 12 underwent subsequent radiosurgery, and 11 had operations that resulted in complete resection of the AVM. Histopathologic examination of the resected specimens was performed. Specimens resected 1 d after embolization showed mild inflammatory changes. Those resected more than 4 d after embolization showed chronic inflammatory changes. Angionecrosis of the embolized vessels was noted in two of the 11 patients who underwent operations. The authors emphasize the need to inject Onyx slowly and to avoid reflux. They also emphasize the need to mix tantalum powder thoroughly with the compound to ensure optimal visualization under fluoroscopy. DMSO compatibility with currently used catheters is also a concern. The solvent has been shown to damage some of the catheters used for its delivery in the past (15,17). The introduction of new catheter designs, including coated catheters, and minor changes in the composition of the agent will solve this issue. In an effort to avoid the inconsistent polymerization rates, the premature beading and breakup, and the inadvertent gluing of the catheter to the vessel wall associated with NBcA as well as the lack of angionecrosis and associated recanalization potential seen with Onyx, Kerber and colleagues began work on neuracryl M (C.W. Kerber et al., personal communication). They sought to develop a radiopaque, injectable embolic agent composed primarily of the basic cyanoacrylate monomer that would stay together as much as possible when exposed to rapidly flowing blood and cause the inflammatory reaction necessary to result in permanent occlusion. The new agent, once polymerized, had to have a soft consistency so that surgeons could easily manipulate embolized vessels. After working with many different amalgamations, they produced a cyanoacrylate-based polymer named neuracryl M.
Initial studies comparing the behavioral characteristics of neuracryl M and NBCA were done using porcine blood in four different settings (19). Drops of the two substances were placed on and beneath the surface of stagnant blood and were also injected into a linear flow model as well as a standardized AVM model. In the stagnant models, NBCA and neuracryl M had equivalent polymerization times, but when placed beneath the surface of the blood, the neu-racryl formed a rubbery mass, which remained at the tip of the needle, whereas the NBCA dropped to the bottom of the beaker, forming a friable mass. When injected in the flow models, the neuracryl remained as a cohesive mass that filled the entire linear flow model and yielded better penetration of the AVM model than did the NBCA. In the linear flow model, the NBCA formed small droplets that embolized downstream in the tubing. Unfortunately, neuracryl M is a cyanoacrylate derivative and as such has the potential to glue the catheter to the vessel wall. As with NBCA, a significant learning curve accompanies the use of neuracryl M. Inadvertent adherence to the vessel wall can be largely avoided by mastering the technique of using cyanoacrylates in the treatment of AVMs and taking the proper precautions. A randomized clinical trial was undertaken to compare neuracryl M with PVA for the treatment of AVMs (20). Among 10 patients receiving neuracryl M, five lesions were totally obliterated. Of the lesions in the remaining five patients, nidus size was reduced by 50-99% in two, and by less than 50% in two others and was felt to have increased slightly in one. This study was an angio-graphic study and did not focus on the histopathologic changes induced by the neuracryl M. Chopko et al. (21) reported the first human histopathologic results in a 34-yr-old man who was treated with neuracryl M 4 d before surgical resection. Histopathologic examination showed scattered foci of neuracryl M that filled the lumen and did not breach the vessel wall. A profound acute inflam matory response surrounding many of the AVM vessels, a giant-cell foreign-body reaction, and angionecrosis were noted. The results obtained with neu-racryl M embolization are promising. Further studies are needed to prove the safety and efficacy of this agent. Dramatic improvements in microcatheter and microguidewire designs over the past several years have allowed for safer, more effective AVM embolization. Flow-directed and wire-directed catheters are used for AVM embolization. In general, wire-directed catheters are used to access low-flow pedicles and flow-directed catheters to access high-flow pedicles. Positioning a flow-directed microcatheter into the distal cerebral circulation is a relatively atraumatic event. It can be difficult to get the catheter to travel distally into low-flow vessels, which can be easily accessed with a wire-directed catheter. Great care is required, however, when positioning a wire-directed catheter to avoid perforating the nidus or pedicle with the microwire. An advantage of flow-guided microcatheters is the lack of a wire and, therefore, a decreased risk of intracere-bral hemorrhage. A disadvantage is the inability to select precisely which pedicle to embolize because this type of catheter is directed mostly by the flow and not by the operator. For wire-directed catheters, the authors commonly use the Transcend platinum tip wire (Boston Scientific Scimed, Maple Grove, MN) or the PVS Synchro wire (Precision Vascular Systems, West Valley City, UT). Either flow- or wire-directed catheters can be used to deliver liquid embolic agents, such as cyanoacrylate, Onyx, and pure ethanol, as well as liquid coils. For par-ticulate agents such as PVA, larger lumen wire-directed microcatheters are needed. Over the last few years, guidewires have been developed that can be passed through flow-directed catheters. Initially, these wires were used only to bolster the proximal segment of the microcatheter, hence, giving it some "pushability." With time, some interventionists have begun to use flow-directed catheters like over-the-wire systems. Using this technique, perforation of the target vessels and breach of the catheter wall are possible, so caution is advised when attempting this approach. Perforation of vessels can occur because flow-directed catheters can be navigated more distally toward the nidus, where the vessels can be more fragile. Moreover, extreme caution is required when passing wires thorough these catheters to avoid damage to the wall of the catheter (The walls of a flow-directed catheter are relatively thin compared with those of a wire-directed catheter.) Improving wire technology (less traumatic tips) has caused the authors to shift gradually toward using wire-directed micro-catheters more often for AVM embolization. Wire-directed catheters are braided and are less likely to be perforated or to burst during glue injection than are flow-directed catheters. imally within the pedicle. When one pedicle is filled, injection can continue until more pedicles on the same feeding branch are filled. Flow-directed microcatheters can be navigated up to the nidus without the risk of wire perforation. These catheters should be checked for small leaks by injecting saline into them before use to prevent complications related to extravasation of embolic material in unwanted areas. In this section, technical strategies applied by the authors in most cases of NBCA embolization and nuances oriented toward goals for the management of a given AVM in a given patient are addressed. After the decision has been made to treat an AVM, the need for embolization is carefully assessed. Angio-graphic and magnetic resonance images are scrutinized to gain a better understanding of the hemodynamics of the lesion and its periphery. Special attention is paid to the proximity of the AVM to eloquent cortex, the presence of associated aneurysms, the pattern of venous drainage, and the presence or absence of venous outflow obstruction. A strategy is devised that is based on the patient's needs. In general, three arterial pedicles or less are embolized in a given session. The rationale here is to allow a gradual readjustment of the regional hemodynamics to occur. If a pedicle is large, embolizing that pedicle alone may be prudent and sufficient. If there are several small pedicles, more than three pedicles can be embolized. Aneurysms associated with the AVM are treated first by clipping or endovascular embolization (either on a separate occasion or during the same procedure). If a pseudoaneurysm or an intranidal aneurysm appears to be the source of hemorrhage, the feeder that contributes to this compartment of the nidus is embolized. In addition, embolization of any arterial feeder supplying a compartment drained by ectatic or stenosed veins is attempted. Otherwise, the pedicle that is easiest to access and provides the best route to the nidus is selected for embolization. Care should be taken to avoid vessels en passage (those vessels feeding not only the AVM but also normal brain tissue). Patients are allowed to recover for several weeks between embolization sessions. A single session may be required for embolization of a small AVM with two to three pedicles, whereas two to four sessions may be necessary for a large AVM. AVM embolization is carried out after the administration of sedative and analgesic agents or the induction of general anesthesia. When embolization is performed in an awake patient, the patient can be monitored for the duration of the procedure, which allows for provocative pharmacologic test injection of the pedicle or pedicles selected for embolization with a barbiturate (amobarbi-tal or methohexital) or lidocaine (i.e., if the AVM is dural based or intimately involved with the cranial nerves or has supply from the external circulation) in an effort to evaluate better the territory supplied by that vessel or vessels. In addition, the medical complications associated with general anesthesia can be avoided. The authors prefer to have the patient awake whenever possible dur ing embolization. Exceptions are patients who are unwilling or those who cannot cooperate because of age, decreased mental status, or claustrophobia. After the patient is positioned on the angiography table and ready for treatment, a cerebral angiogram is performed that includes the external carotid arteries. The treatment strategy is assessed according to current angiographic findings about the hemodynamics of the AVM. A bolus of heparin (60-70 U/kg) is administered to achieve an activated coagulation time in the range of 250-300 s. After the target feeding vessel has been selected, a 5- or 6-French guide catheter, which is connected to a heparinized saline drip, is placed in the brachiocephalic vessel of choice using over-the-wire and road-map techniques. A microcatheter (either wire- or flow-directed) is connected to the heparinized saline drip. Vigilant attention is paid to avoiding air bubbles and blood clots in the catheters. After treating any proximal aneurysms with coils, attention is directed to the chosen pedicle. Using road-map techniques, a wire-directed catheter can be navigated close to the AVM nidus, with a soft-tip guidewire used to avoid vessel perforation. Flow-directed catheters follow high flow and can be pushed forward by injecting small amounts of saline with a 3-mL syringe. Care must be taken to ensure that the microcatheter is as close as possible to the nidus without entering and perforating the fragile vessels of the nidus. With the micro-catheter in position, provocative testing of the feeding pedicle is carried out. Neurological examinations are conducted before and after test injection. 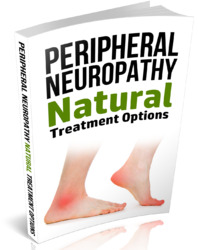 Typically, an injection of 20 mg of lidocaine will effectively produce symptoms referable to a peripheral nerve within that vessel's distribution. If the vessel anastomoses to the external carotid artery, we are especially careful to administer lidocaine and perform a detailed cranial nerve examination (Table 2 lists possible dangerous anastomoses between the extracranial and intracranial circulation.) Symptoms referable to the retina can also be detected with lidocaine if the pedicle is in close proximity to the ophthalmic artery. If lidocaine administration is tolerated without symptoms, 10 mg of methohexital or amobarbital is injected through the microcatheter. The methohexital or amobarbital will depress the cerebral activity in the brain within that vessel's distribution. A detailed neurological examination is then performed to ascertain whether any new neurological symptoms have resulted. The authors have found this combination of tests to be very useful before permanent sacrifice of AVM feeding pedicles (22,23). Even when the examination is unchanged, caution with NBCA embolization is recommended. Flow patterns through the microcatheter and pedicle will change while the glue is being injected, so glue may begin to embolize to eloquent branches that the methohexital did not reach because it was injected when the malformation was fully patent. Adapted from Standard SC, Hopkins LN. Principles of neuroendovascular intervention, in Endovascular Neurological Intervention (Maciunas RJ, ed. ), The American Association of Neurological Surgeons, Park Ridge, IL, 1995, p. 16.
tantalum powder for radiopacity. Moreover, modifying the ratio of ethiodized oil and NBCA will vary the polymerization time. For direct arteriovenous fis-tulae and high-flow regions, the ratio of NBCA to ethiodized oil should be higher than for low-flow areas. High-speed (30 frames/s) angiographic images are obtained through the microcatheter to measure the transit time and degree of flow before embolizing the pedicle. For most situations (moderate-to-low flow), the authors use an ethiodized oil to NBCA ratio of 3:1. Changes in the speed of compound injection alter its embolization properties. In our opinion, altering the injection rate is probably better than altering the mixture for different microangiographic patterns. Furthermore, ethiodized oil is more viscous than NBCA. Therefore, changing the ratio has more of an effect than simply changing the polymerization time. Alternatively, detachable coils can be used to reduce the flow through the fistula. Because the NBCA polymerizes on contact with blood or saline, the preparation must take place in a sterile, ion-free environment to prevent the occurrence of premature polymerization. The interventionist changes gown and gloves and prepares the glue on a sterile table with sterile instruments. The tantalum powder is first mixed with the appropriate volume of ethiodized oil in a 3-mL syringe. NBCA is then added. The syringe is then well shaken for 2-3 min to ensure complete mixing. While the operator mixes the glue, the assistant isolates the tip of the micro-catheter with clean towels and flushes the microcatheter with a sterile dextrose solution (D5W). The assistant then creates a negative roadmap using the previously determined optimal angiographic projection. Alternatively, fluoroscopy can be used without a roadmap on one screen while an image of the pedicle and nidus obtained from the most recent angiographic imaging (and the same projection as will be used for the injection) is projected on the adjacent screen. After the glue is well mixed, the operator injects it and observes filling of the nidus. Following the injection, the microcatheter is removed while suction is applied by the operator, and the assistant quickly withdraws the microcatheter from the guide catheter. An angiographic run is then obtained through the guide catheter to assess the effects of the embolization. If the patient's condition is unchanged neurologically and if another pedicle requires embolization concurrently, the new pedicle is accessed and embolized as above; otherwise, the procedure is terminated. Patients are observed in the intensive care unit for one night and discharged the following day if they are neurologically stable and without a severe headache. The authors allow a 3- to 4-wk interval between embolization sessions. Acute complications of embolization that require special attention in the endovascular suite include but are not limited to vessel perforation with intra-parenchymal hemorrhage, intraventricular hemorrhage, gluing of the catheter to the nidus, and occlusion of draining vein(s). Intraparenchymal or intraven-tricular hemorrhage can be detected by a contrast blush observed on angiogra-phy or by a change in the patient's neurological exam. An intubated patient who experiences unexplained bradycardia and hypertension (Cushing's reflex) should be suspected of having an intracranial hemorrhage. If a hemorrhage is suspected, the procedure should be aborted, anticoagulation reversed, and a computed tomographic scan obtained. If a neurosurgeon is not a member of the endovascular team, one should be contacted immediately. An awake patient who becomes unresponsive should be intubated for intracranial pressure management and airway protection. An external ventricular drain may be indicated to monitor and control intracranial pressure. When a catheter is glued to the nidus, the catheter should be cut at the groin region. If surgical excision of the AVM is possible, excision with removal of the catheter during AVM resection may be possible. If the AVM is not surgically accessible, anticoagulation therapy (when it can be administered safely) should be considered to prevent the formation of clot on the catheter. Fig. 1. Anteroposterior (A) and lateral (B) projection angiograms of the right hemisphere demonstrate an arteriovenous malformation (AVM) fed by anterior cerebral artery (ACA) and middle cerebral artery (MCA) branches. Superselec-tive angiography (C) via an ACA pedicle shows the AVM angioarchitecture with no evidence of vessels en passage. draining veins in surgery before isolating the nidus can lead to hemorrhage. If only a small amount of venous drainage has been compromised, close observation in the intensive care unit with blood pressure control is an option. The safety and effectiveness of AVM embolization with NBCA has been reported in multiple series (2,14,24-26). 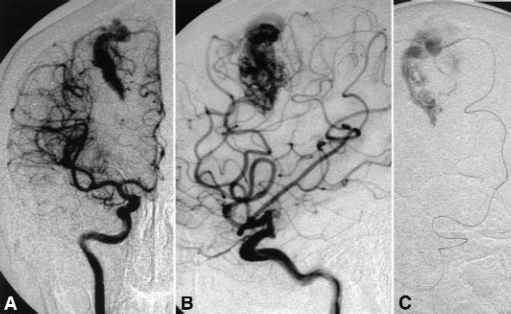 Embolization resulted in 50% or more reduction in AVM size in most patients in these series. 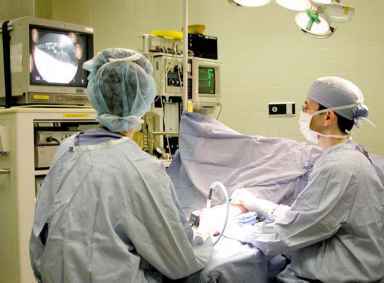 Surgeons have reported greater ease during the excision of embolized versus nonembolized AVMs (2). In a recent report on the effectiveness of combining Gamma-Knife radiosurgery and endovascular embolization, AVM obliteration was achieved in 46% of patients (8). Complication rates ranging from 3 to 25% have been reported (15). A 41-yr-old woman was diagnosed with a right frontal AVM during head trauma evaluation (Spetzler-Martin grade II). 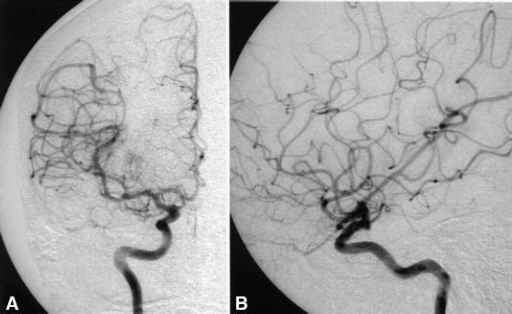 The AVM was fed by branches of the right anterior communicating artery (ACA) and right middle cerebral artery (MCA) (Fig. 1A,B). Both the ACA and the MCA pedicles were embolized with NBCA during the same session, with complete AVM obliteration achieved. A follow-up angiogram 12 mo after the procedure showed no recurrence of the lesion (Fig. 2A,B). Fig. 2. Anteroposterior (A) and lateral (B) projection angiograms of the right anterior circulation demonstrate no residual AVM.